The middle of the month was the biggie, no doubt: actually moving here after 3 years of visiting (It was 3 years ago last Friday - the 29th - that we first saw the house). 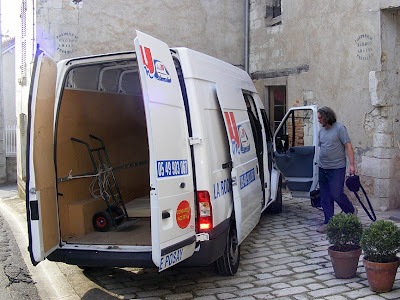 It was disheartening loading a truck with all our stuff and then discovering we own more than a truckload, but I found it interesting going back to London via the National (non-toll) routes in a Hire Van to pick up the balance. Since we have been resident here we have discovered one or two new evening walks, met people we were introduced to through this blog, Susan drove up the main street, we had "Apéro-dînatoire" for the first time, taken 571 photos (to add to the 53 I took before we left London and the 158 I took in London when I drove back). been to a new hardware store, shifted boxes (and then shifted them back again) and - oh yeah - we bought a garden. Typically, we jumped in at the deep end and have bought 3/4 of an acre (or 2,900 sq metres) of beautifully tended vegetable plot and orchard. 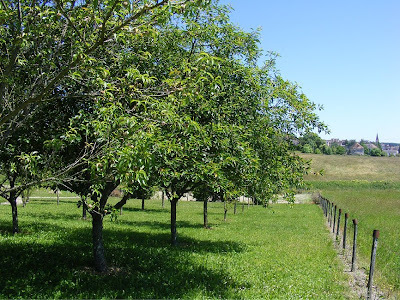 35 fruit trees, including cherries, peaches, apples, pears, various nuts, nectarine, plums and an apricot tree. Quite how we will deal with 7 trees worth of peaches and 6 of cherries we have yet to discover, but it should reduce our fruit bill at the market! Looking towards Preuilly from our new garden, yesterday. We haven't yet signed the deeds, but we have agreed a price and the previous owner is anxious not to be maintaining the garden for any longer, so within two weeks we hope to be planting our melons. So far so good then. Next step is actually starting work proper on restoring the house rather than nest building, and speaking French to each other whenever we are in public. I must be honest – I am not really all that keen on pain d'épices generally. 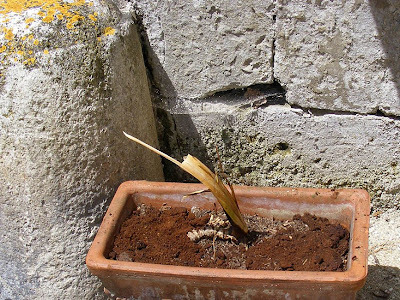 However, since this is a much-loved traditional cake in France, I have perservered with it. I've tried to like it and acquire a taste for it, but it features large quantities of honey and a particular mix of spices that strike me as far too medicinal. I love honey of all sorts, but on toast with butter, not combined with spices like cloves and anise which only accentuate the medicinal character. Honey is not easy to cook with. 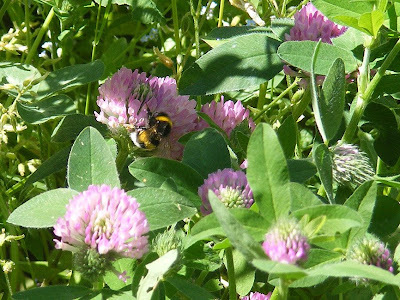 It usually dominates any recipe you add it to, and in the Touraine, the very strong dark miel de sarrasin (buckwheat honey) is widely considered the best honey for pain d'épices. It makes for a distinctive and memorable cake, but for me it's not really the best use for this wonderful honey, regardless of what the locals may say. Whenever I come across a new recipe for pain d'épices, I like to try it in case it is The One That Changes Everything. Well, hurrah for David Lebovitz and his friend Flo Braker. They've come up with the goods. Comme d'hab (As usual) I tweaked the recipe a touch to suit myself. I substituted ground allspice for the ground cloves and cardamom seeds for the anise. I thought this combination worked particularly well, even if it isn't quite traditional. There is orange zest in the recipe, and cardamom and orange always work well together. I also like the crunchy texture of the tiny cardamom seeds. 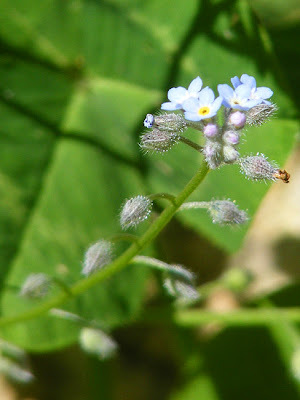 The honey I chose was a relatively mild but not characterless English Borage honey. I noticed that David L comments that he feels buckwheat honey is too strong also. For my next attempt at it I will substute some of the flour for about half a cup of finely chopped walnuts. 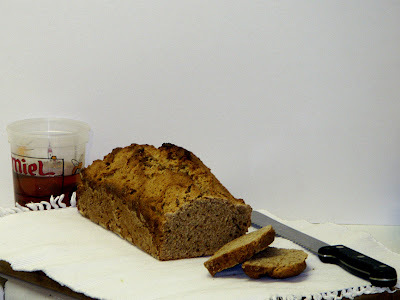 I think they will add a texture and flavour that will work well, adding an alternate local touch to the buckwheat honey and making an ever so slightly more moist cake, with a pleasant nut flavour that will combine with the spices admirably. This pain is more like a British teacake such as Bara Brith in that it is dense, not terribly sweet, and best eaten spread with butter, or even better, with soft cheese (St Moret would be a good choice in France, outside France, good old Philly is the obvious one). Traditional Pain d'épices itself has little or no fat, so you could also choose the traditional French approach of dipping your slice in coffee or tea for a lo-cal treat. The rising agent is baking powder, not yeast. Susan over on Wild Yeast recently posted a most interesting looking recipe for pain d'épices using mustard to provide the heat that pepper normally gives. I haven't had a chance to try this one yet, but will eventually get round to it. Pain d'épices lasts for days and days, if anything improving with a little age. It also freezes very well. You can see a previous attempt at Pain d'épices here. 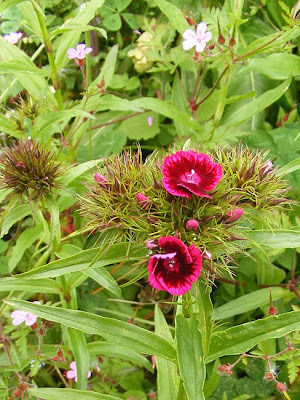 Last year Simon helped me prepare a rough garden bed and I sowed seed to grow annuals and biennials that would attract insects. 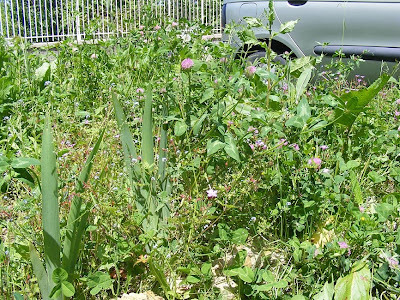 Once it was sown, I just left it alone, and it has been fascinating to see what has come up this year, and what the mix is between plants that I sowed and plants that have just come of their own accord. 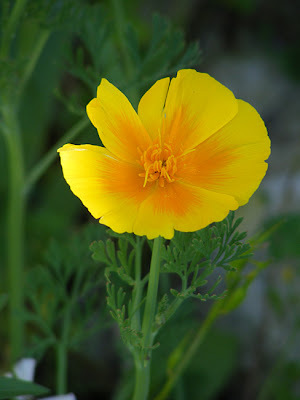 A classic egg yolk yellow California Poppy. 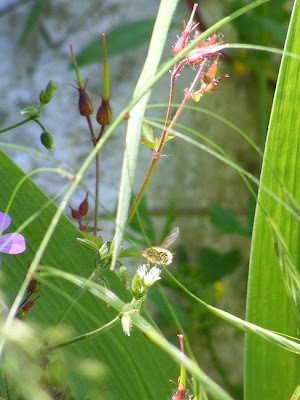 In addition to the wildflowers, a great variety of insects have visited: 4 species of damselfly; 4 species of bumblebee, European Honey Bees Apis mellifera (Abeille européenne) and probably a dozen other species of solitary bees and wasps; a similar number of fly species, including several types of hoverfly and 3 species of beefly; a young bush cricket; half a dozen species of butterfly and a few moths; and a couple of bugs and beetles – and these are just the species I noticed without any effort at all. The place is an insect café, and the regulars know that there is food and places to sit in a warm undisturbed spot. One of the nice things for me is that I can hear everything buzzing, and get to know the different pitches for the different species. 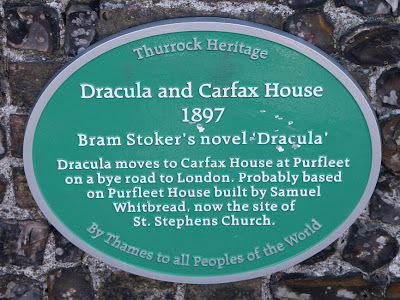 In London this was impossible, as there was always background traffic noise. Simon is embarrassed by this garden and worries that the neighbours will think we are lazy and untidy, and that all our hard work removing the bramble patch will come to nothing if I let the space get overrun again. I think that the neighbours are sensible enough to realise that we have quite enough to do at the moment and will not make hasty judgements. In the next few weeks I will have to tidy it all up, as it is in rather an inconvenient place, but it has been a fun and enlightening exercise while it lasted. We have now been living here for over two weeks (give or take some days away for me) and have decided that washing in a plastic basin leaves something to be desired. We reached a decision the other day that we would buy an instant hot water system like one of these and install a cabine de douche that sort of looks like this. This will be installed on our new bathroom floor, using the old wastewater pipe and some new plumbing I will be putting in. With this in mind we went to the hardware shops in and around Chatellerault (of which there are many) to price shower units. Most of them were well out of the price range suitable for temporary installation, but we did find one we rather liked (and could afford) in Brico Depot. (The plan here was to include a link, but their site is down for maintenance.) 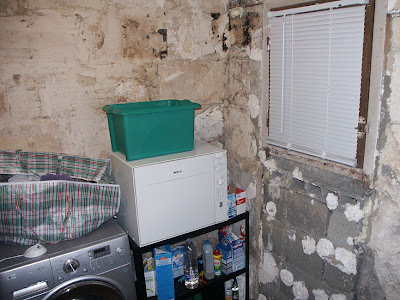 We ummed and ahhhd for a while - as you do - and decided not to buy there and then because I wasn't sure if it would fit into the space between the wall and window, so we would come home to measure up and make a further decision. We will be returning, with trailer, to buy the shower some time later this week or early next. While we were hardware shopping we bought a venetian blind for the laundry/toilet. This means we can have a light on when we use the room at night - previously we just had a cheap red gauzy net thing up which you could see through. No more rummaging in the dark! We stopped for lunch at a Brittany themed crêpe house in Chasseneuil and had three courses and cider for 10€50, which was rather good and tasty, and then because the time was only 1.00pm and the shops wouldn't be open until after 2.00 we went to the riverside park in Dissay. 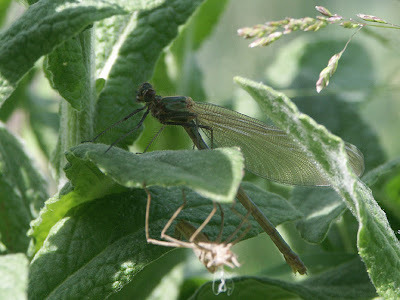 There we watched newly emerged Banded Demoiselles Calopteryx splendens (the French name is le Calopteryx eclatant) drying their wings before flying off. 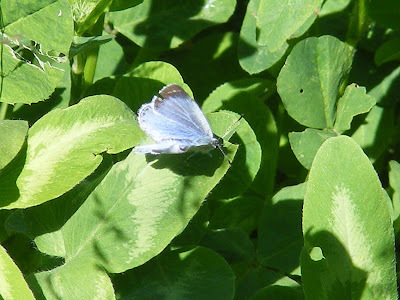 There were dozens of glittering blue males flipping and flapping in their rather indecisive way over the riverbank grasses and herbs and out onto the Water Crowfoot growing in the shallow sluggish river Clain. her laval case, which is also visible. When we arrived home we found that some small plants had been delivered by friends for us to babysit while they are away, and a box of cherries. Clafoutis for pudding tonight then! 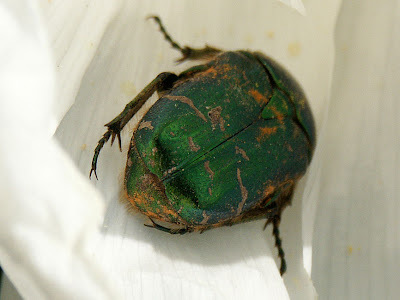 Just now, the Rose Chafers Cetonia aurata (Cétoine dorée) are very much in evidence, buzzing their way in through the open windows of the house and then out again with a little encouragement. 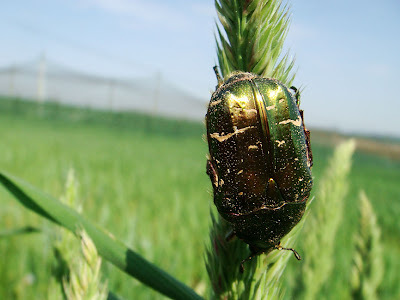 If you sit in the garden, one of these big metallic green beetles is quite likely to crash into you, shuffle its wings a bit to get them back under the elytra and walk sedately up your arm. It will soon figure out that you are not a tasty flower stamen and launch itself into the air again, with much thrumming and revving. 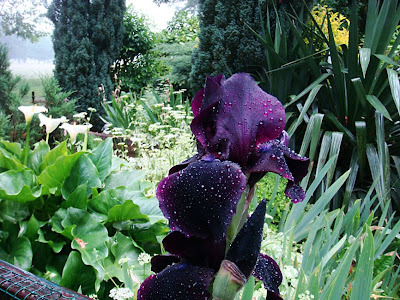 Le Jardin de Lucie has some lovely photos and plenty of interesting detail about the species (if you understand French). Once I had loaded all the excess boxes and plants into the van, I had two days to myself. I had dinner with my Uncle Geoff and Aunt Pat (who also let me use their shower) and used their internet to try change my ferry booking so I could come home early. Changing the ticket would have cost me more than the original return ticket had cost, so I decided to stay until my original return time; Sunday. I booked myself into a hotel near where Susan and I had been living (it was cheap) and slept like one of the innocent (after having another shower - I don't know if you can go into credit with showering, but I did attempt it). and clean, and cost only £36 per night if booked online. On Friday I went into London with Kippa (my brother's second son) which was fun - we wandered around some music shops and computing stores, stopped off and had a cup of tea (as you do) and just checked things out. Pat and Geoff had invited me for dinner again on Friday night, so I went to their place (via the hotel) and rounded off a generally pleasant and relaxing day. Once across the river I parked in tourist filled (and I do mean filled) Greenwich, home of the Cutty Sark, the Royal Observatory, the Royal Naval College (now Greenwich University Campus, currently being used for filming The Wolfman) and the National Maritime Museum. Down by the Cutty Sark. 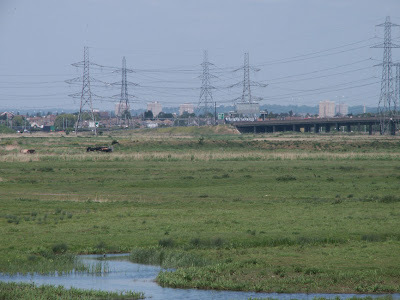 My brother lives very close to here. In the evening before dinner we had a walk around Greenwich Park, home of the Royal Observatory, looking for various Anglo Saxon Tumuli, Roman Remains and other old Stuff. 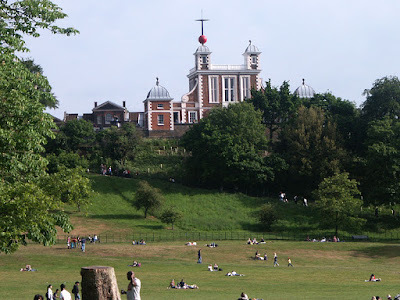 The Royal Observatory, where west meets east. 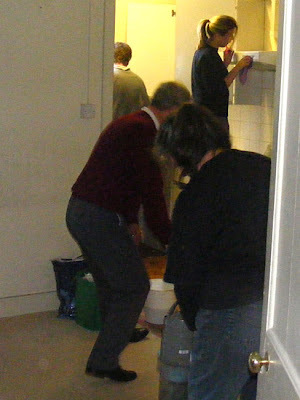 After dinner Jono, Rosie and myself went mudlarking, as the tide was quite a long way out. We found plenty of clay pipe stems, some saltglaze pottery, and what I claim to be a piece of Roman Samian ware. On Sunday Morning at 4.00 I left Jono's house, and in the 10 metre or so walk to the car was the victim of an attempted mugging. Nothing was stolen, (the mugger was so stoned he didn't seem to notice I was carrying a camera and a briefcase, he only wanted my phone) but I do have a lump on my jaw where I was punched. Only my pride (and my faith in humankind) was really hurt, but it wasn't the best way to end a weekend away. 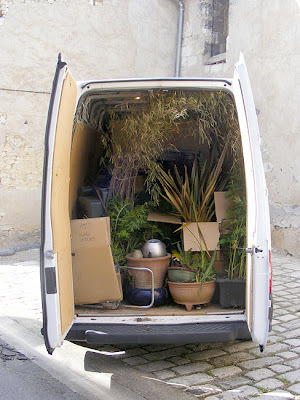 The drive home was uneventful (I didn't need any more excitement anyway) and we were amazed to find on arrival in Preuilly that the plants had thrived in being in the back of the van for 3 warm days and everything appears to have survived. We were well impressed with the van hire - I had booked 5 days and 2000 kilometres, but in the end I only did just over 1500km. When we were presented with the bill it was 5 days - and 1500km. I used just over 100€ of fuel which means I did about 30mpg even though half the time I was carrying a full load and travelling at open road speeds, and it had long wave on the radio which meant I was able to listen to the cricket. I do feel now I have now arrived in Preuilly after two weeks of officially being here. PS - we had the world's weakest thunderstorm yesterday evening - 4 drops of rain and a couple of thunderclaps. It wasn't even enough to water the plants. 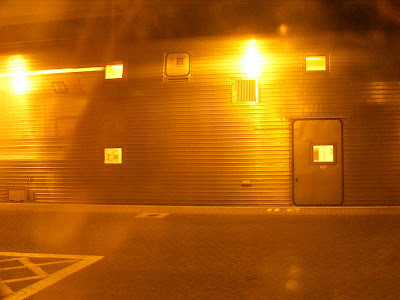 I left Preuilly on last Thursday at a couple of minutes to 8.00pm. I had decided that as the van was not fast enough to take advantage of the autoroute speed limits and the tolls would be about three times that for the car (so about 100€ each way) I would drive by the national routes. This worked quite well. The trip is a couple of hours longer, but this is almost compensated for by the view of Chartres Cathedral all lit up. 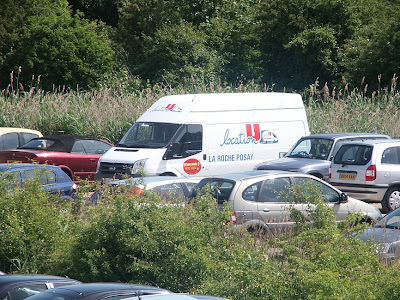 Unfortunately, it does entail approaching Rouen from a different direction, and this is where the fun started. When I managed to get off the tram tracks I found myself on a ramp onto a bridge crossing the river back towards le Mans, which wasn't part of the plan either. Four consecutive left turns didn't get me back to the road I had been on, but rather the middle of a suburb with no signposts. I was bemused by this, rather than worried, because Rouen always does this to me and I knew that sooner or later I would find somewhere I had been lost before and all would be resolvable. At 1.00am Rouen spat me out onto the A28 towards Boulogne, and my plan was to stop at an aire de service, in this case the one at Maucomble. It was a bit full and I think I managed to wake everybody up, first by having to reverse the whole way back through the carpark because I had not managed to make my mind up as to where to stop, and then by slamming doors and cooking dinner. Still, I managed to get a couple of hours sleep. Four hours later I woke, drove to a more picturesque aire (Bois du Coudroy) and had breakfast. This was good and civilised and everything, as I managed to make myself coffee. 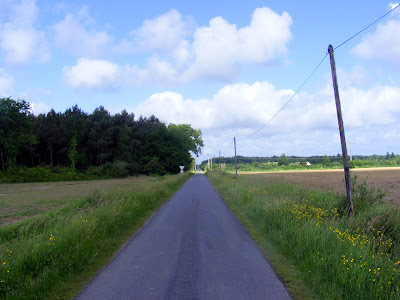 A couple of hours after that I was driving into Boulogne, and was pretty chirpy at having saved all that money and seen some new part of the country, but most of all because I had managed to avoid the stretch between Rouen and Le Mans on the A28 (maybe one of the country's most boring roads). I was using the new ferry service from LD Lines, which replaces the Speedferries service Boulogne - Dover. The LD Lines boat is a lot bigger, so it gave me some different views of the home of the largest fishing fleet in France (apparently). The ferry was nowhere near full, so after taking a lot of photos I found myself a quiet corner and had a snooze. 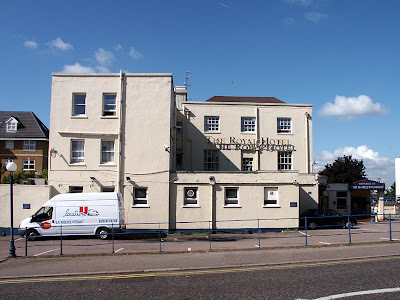 I managed to wake in time to see the white cliffs hove into view before collecting the van and setting out on the English motorway system in a long hired van - which I had been anticipating with the sort of joy I usually reserve for Rouen. Luckily, I found the driving not to be a problem, and 2 hours later I was standing in the driveway of the house we lived in for 10 years. That was weird - and I felt absolutely no attachment or regret about the place - just a desire to get loaded and get away as fast as possible. 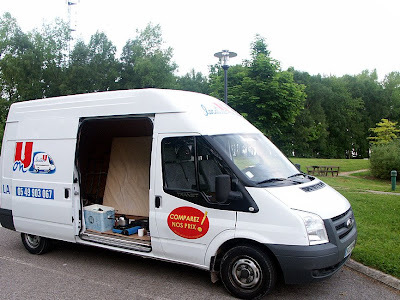 The thought occurred to me while I was in London - 20 years as a professional musician, yet this was the first time I had ever driven yer actual Ford Transit. Not a bad vehicle, as it turns out. I may have clipped one or two curbs, but that is mainly due to the length of it (just under 6 metres) and the fact there are some pretty narrow roads around. The seat was more or less comfortable, it steered ok - although when fully laden it does bear remembering that roundabouts are things to be respected and forward planning is needed - and when empty it zipped along not using a whole bucketload of fuel. 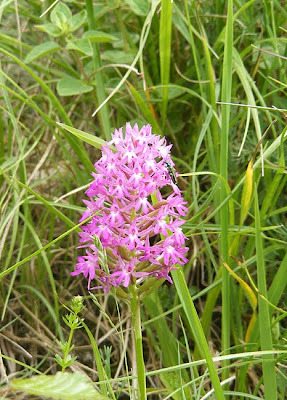 The Pyramidal Orchids Anacamptis pyramidalis subsp. 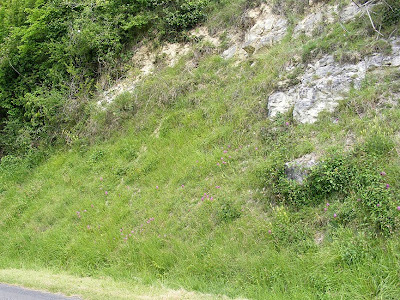 pyramidalis (in French Orchis pyramidal) are out in profusion on certain sunny chalky hillsides and roadsides this week. Just as you leave Chaumussay on le Petit Pressigny road is a good spot for them, as is opposite la Forge, between Preuilly-sur-Claise and Chaumussay. The first of the Lizard Orchids are out on le Petit Pressigny road too. 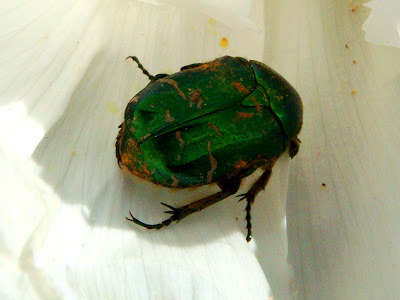 This one is visited by a male Thick-legged Flower Beetle Oedemera nobilis (in French Oedémère noble), easily recognisable by his enormously 'muscular' thighs (click on the picture to enlarge and check them out). 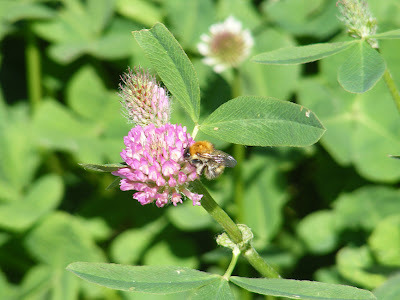 Note the wild marjoram Origanum vulgare (in French Origan) in the background too. I even found a Pyramidal in the shade of the woodland on the hill behind Chaumussay. The Lady and Fly Orchids are almost finished here now. Once they have flowered, all trace of them disappears very quickly. The Monkey Orchids are still in flower, but past their best. The Violet Limodore is in bud by the path. Let's hope no one picks it this year. I found evidence yesterday of a number of Lady and Monkey Orchids which had been picked, their stems showing a neat diagonal cut made by a sharp blade. 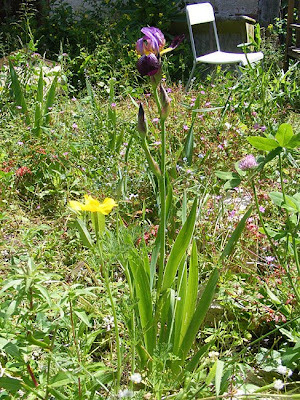 Chris Luck, from Planete Passion, says that picking of wildflowers including orchids seems to be on the increase. People have traditionally picked them for personal use as table decorations, but Chris fears that some of the activity now is commercial. What I find interesting is that I never see signs that roadside orchids have been picked. It's always those growing in quiet, semi-secret places where one rarely meets another person. It makes me think that the orchid gatherers know that what they are doing would be frowned on by others. Lady Orchids are common over much of France and not protected in our region, and Centre is one of the few regions where Monkey Orchids are common enough that they are not protected, so it is not illegal to pick them in the wild here (note that Monkey Orchids are protected in all of the neighbouring regions, including Poitou Charente). 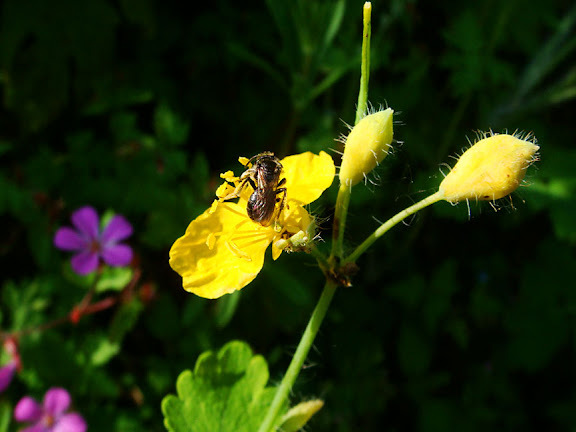 Personally though, I am uncomfortable with picking any wildflower and would discourage the practice. 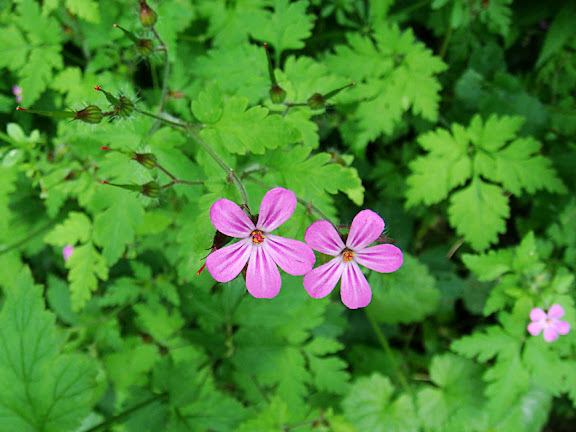 However, the rule of thumb, if you really want to pick wildflowers, is to only take 10% (ie one in ten). This sounds like a tiny amount, quite unnecessarily conservative, but experience shows that this level of harvesting ensures the plant remains numerous enough to set sufficient seed for next year; to survive anyone else who may come along and pick more; for enough to make it through any spells of bad weather that may hit, and so on. 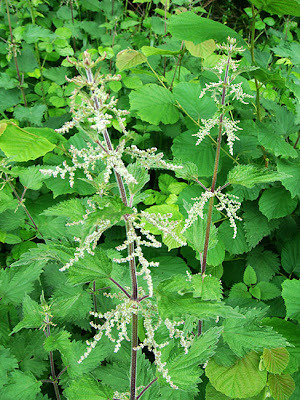 The same rule of thumb applies to the harvesting of wild food plants. Never underestimate just how quickly and dramatically a common species can decline beyond the point of no return. 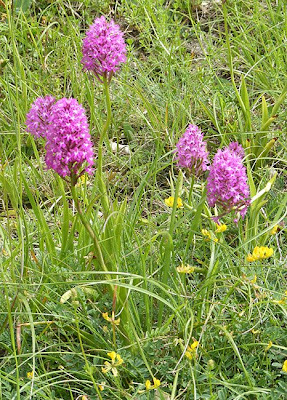 Pyramidal Orchids are localised and quite rare in this region, and as a consequence are protected and it is illegal to pick them. They grow in numbers in relatively few places, and it is a joy and a privilege to be able to see them. 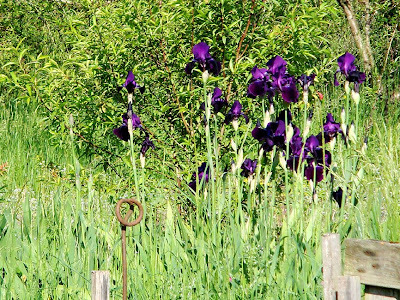 Irises are one of my favourite flowers and one of the plants I am looking forward to being able to grow well in Preuilly. Our London garden was too shady, and they never really did very much. 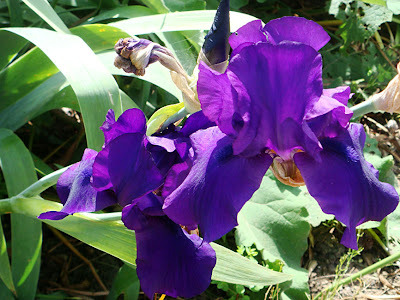 Our friend Jill very kindly gave me three different colours of Bearded Iris to start off the Preuilly garden last year. One of them had its first flower yesterday, and turns out to be a gorgeous deep reddish purple. 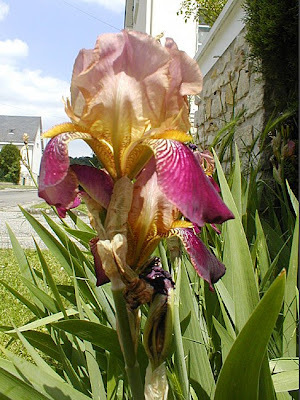 Our first Bearded Iris flower. 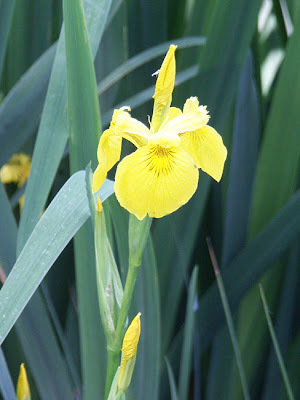 *Steve the Siberian Iris is more properly called Iris sibirica 'Steve', a cultivar named after it's breeder Steve Varner. In March I visited the Powerhouse Museum in Sydney and had an opportunity to go around their exhibition Inspired, which is an examination of design trends from the last few centuries and tends to focus on Australian designers who have been influential either at home or abroad, as well as those born overseas who have had specific influence in Australia. 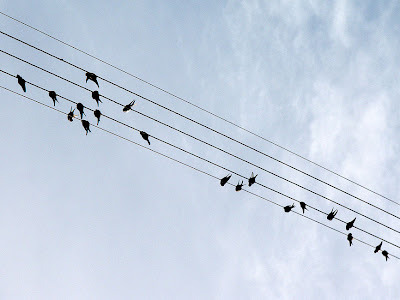 There is a surprising number of French connexions. 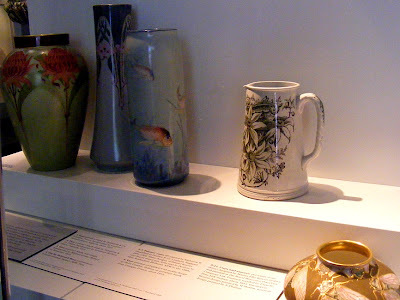 The vases first and second left and the one at bottom right are hand-painted on Limoges porcelain blanks. The two on the left were decorated by Lawrence Hotham Howie in South Australia, about 1910. 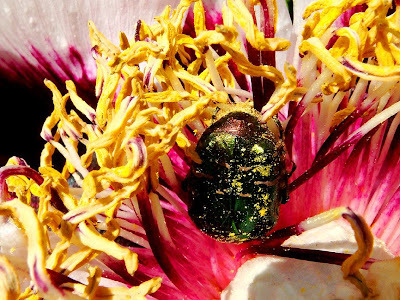 He has used very distinctive Australian wildflower motifs, waratah and eucalyptus. The one on the right with a cicada motif was painted and gilded by Delia Cadden in Sydney about 1913. Limoges is chiefly known for the technical excellence of its Renaissance enamels and later, porcelain, which is still manufactured in the area. By the 19th century the Limoges factories were mostly producing blanks ie plain white ceramics, which were shipped all over the world to supply ladies who indulged in the popular pastime of china painting. The blanks were also used by professional designers and artists like Delia Cadden, so although Limoges porcelain is very collectable today, the quality varies wildly. The city itself is about two hours away from us to the south. We get to go there every so often by accident, when our plane is diverted from Poitiers due to fog. The other object that interested me in this case was the jug. It is English creamware with a transfer print of flannel flowers from 1914. 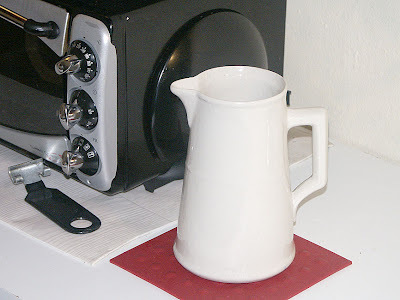 I own a jug reminiscent, but undecorated, purchased in Futurotroc on the outskirts of Poitiers. I use it for milk, since ours comes in a plastic bag, which can be a bit dodgy in the fridge. When I bought the jug, it was a toss-up whether I would choose it or a set of Limoges coffee cups (demi-tasse) and saucers. I figured that for the time being at least, I'd get more use out of the jug. 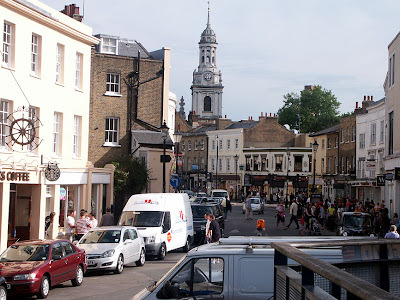 Simon set off yesterday evening in the van we hired from SuperU to pick up the remainder of our possessions in London. I am impressed with the stoicism by which he volunteered for this irksome task and hope that the journey goes as well as can be expected. On the positive side, as he says, once it's done, it's done, and he can settle down and focus on being Prulliacien. And the trip has resulted in two milestones for me. First, I got to drive up the Grande Rue all by myself, coming back from SuperU, while Simon drove the van. True, driving up the Grande Rue is the direction which is not always blocked by parked cars, and true, at 7.30 on Ascension eve, very few cars were parked on the other side any way, meaning that the three cars coming down the Grande Rue were able to easily weave and dodge the parked cars and me. Nonetheless, for someone who has not driven for 12 years except a few practice runs on quiet French country lanes, driving from the outskirts of La Roche-Posay, via two roundabouts, the main road between La R-P and Preuilly and the notoriously fraught main street of Preuilly-sur-Claise without causing anyone along the way to look alarmed is an achievement I am quite proud of. The second milestone is that this is the first time I have spent alone in our house. Simon has been here a lot on his own, but I never have. and I am still shifting boxes. We now have rationalised the piles of stuff that was taking up all of the space in the granary into one neat and safely stacked pile of boxes and extra furniture. 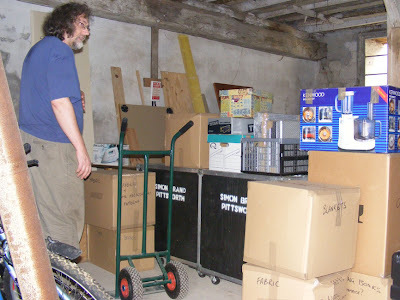 I commented the day after we arrived that the space I cleared for our stuff was nowhere near big enough, but we have had a reversal in that situation: now we have boxes in only one corner of the barn. It is difficult to believe we have been here one week, the time has really flown. Although we have not yet made huge progress towards restoring the house we have made it more livable; our front room (and combined bedroom/dining room) has our bed from London, a 1930s oak extending table and a pair of antique Australian wardrobes in it and is comfortable if slightly cozy. We also have a pair of Ikea bookcases in there (that is pronounced Eekeeya, according to our local Sweedish expert, so we're all wrong!) and some of our favorite books to make it feel like home. 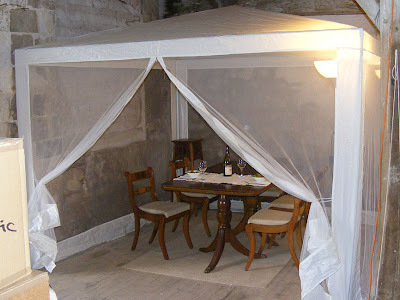 I have also erected our gazebo tent thing (as last shown here) as a dining room in the space I have cleared in the Granary. We used it for the first time yesterday evening, and if you disregard the scenery of workbench, tool storage, a pile of boxes and stuff waiting to go to the dechetterie, it's quite elegant. This evening I am off to London again. I have hired a long wheelbase Ford Transit from SuperU and am driving to somewhere (probably an aire) the other side of Rouen for an night's sleep in the van. 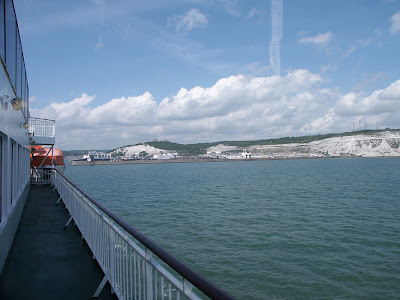 Tomorrow I drive to Boulogne for the 10.45 LD Lines ferry to Dover. While in London I am picking up the stuff that didn't make it last time, then on Sunday at Stupid o'clock I catch the ferry back from Dover. When that trip is over I will be able to claim I am now living in France. 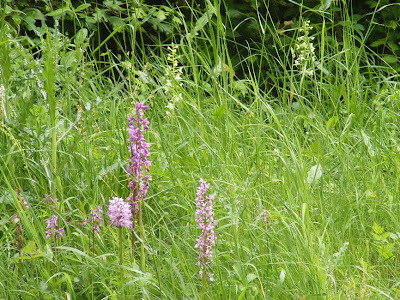 May is the peak season for orchids around Preuilly, and several species are very easy to spot on the roadside as you are driving along. We took this photo last Friday on the way to the supermarket. Three species of orchids are in profusion on the roadside here at the moment – Early Purple, Greater Butterfly and Monkey. 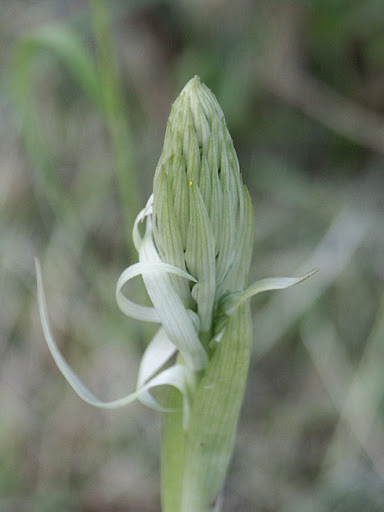 Nearby, in Boussay, the Monkey orchids are flowering and the big Lizard Orchid bud spikes are clearly visible. 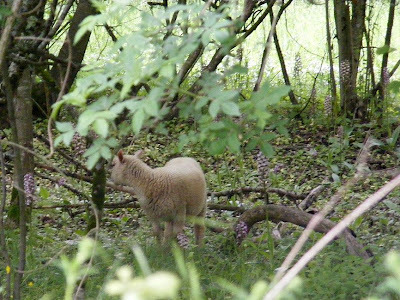 In the sheep fold near Jean Dufy's house, La Boissière, ewes and lambs share the wooded areas with Lady Orchids. 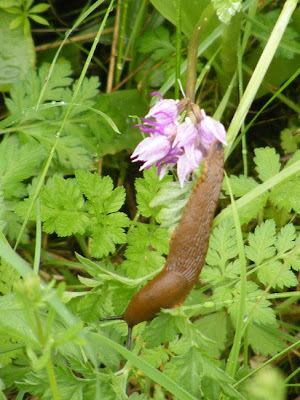 This slug was using a Monkey Orchid as a bridge to cross to some presumably tastier plants. Our gardening activities, being restricted at this stage to the front courtyard and therefore very visible, have created a lot of interest from the locals. Almost everyone stops to inspect, and if I am around, comment. Usually the comments begin with Ca pousse !, which took me a while to figure out, but Bengt gave me the clue I needed. The verb pousser means 'to push'. You see it all the time on entrance doors (poussez), but the word can be used quite broadly to mean to thrust, shove, urge on, drive, impel, prompt, utter, grow, shoot, push on or forward and pousse is growth or shoot. The neighbours are impressed with the size of the plants we have arrived with and all the new growth they are putting on. They are particularly curious about the contorted hazel, asking what it is. So far, everything has been pronounced très beau, even by those who I am inconveniencing by removing their handy free parking space in a very narrow street. Yesterday, before the rain started, I clipped our potted box bushes into spheres in the front courtyard. An elderly woman stopped and complimented me on how nicely the box bushes were shaping up. When she realised my French was limited she asked me if I spoke anglais. We then continued the conversation with her using her rusty but quite good English. of old electrical flex I found lying about. Next a man drove down the street, clearly with the intention of parking on the courtyard, but stopped when he realised it was occupied. Winding down the passenger window he called across something along the lines of 'Hey that's my parking spot! ', to which my response was 'No, this is my courtyard!' It was all perfectly amicable, and he then proceeded to inform me that I should wait until August to trim the box bushes. I mollified him by saying that they had not been clipped at all last year, so I thought I would do them now so their twigs were not too thick and tough to clip easily. 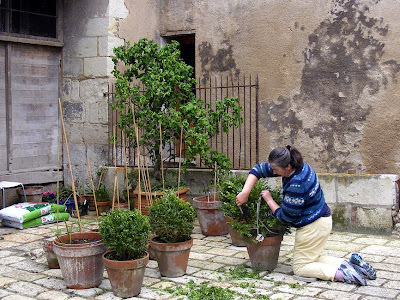 Actually, I think now is probably ideal for clipping box in the Loire, and they will probably need to be done again in August. In England box is traditionally clipped on or after Derby Day in early June. This is to make quite sure there is no danger of frost. I suspect my neighbour was suggesting August because the box won't grow much after then, so looks good all through winter, and then puts on plenty of attractive bright green pousses during the summer. 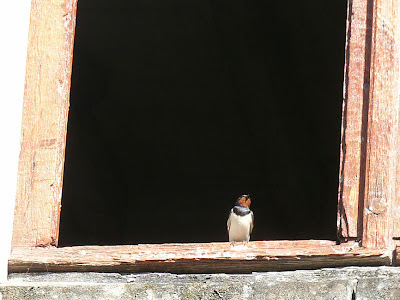 The swallows arrived about 6 weeks ago, which is always the most reliable sign that the warmer weather has arrived. Not that you would have believed it yesterday; it was cold, windy and rainy. Bengt came over for dinner last night, which was really pleasant. We have started moving the furniture into rooms, so were able to entertain him at a table, sitting on chairs!!. This is an innovation for us, and it was a real change not to be perched on the edge of something, balancing our dinners on our laps. We have caught the Eurostar from London to Paris and Brussels a number of times, but until the day of our move we have never put our car through the tunnel. We decided that because we had to be in tip-top condition on Tuesday that we would go by Eurotunnel and book into a hotel for the night. 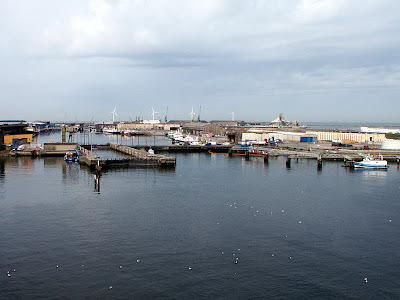 This was a wise move as the channel was pretty rough due to high winds, and I don't do lumpy sea any more. Compared to the ferry the tunnel is a lot more expensive, but it saves at least an hour on your trip. Another thing I like is the stated policy that if you arrive within 2 hours of your train's departure they will put you on the next available train. This compares favorably to the ferry companies who tell you over the phone "if you're late just turn up and we'll take you" but never put it in writing. one Eurotunnel shuttle from another. Security is tight - explosives checks with sniffer machines, but no passport control was in operation, and it's just a case of follow the signs, drive onto the train and have a powersnooze. There is nothing to do on the train, but there are toilets (which neither of us felt the need to try out). The trip takes about 30 minutes, and you just drive off at the other end. We were surprised at how quick unloading was compared to the ferry. To celebrate our arrival in our new country we made a movie.